“4chan is leaking.” This is what users of the link sharing website Reddit say when they see a certain sort of comment, typically a personal anecdote that begins plausibly but rapidly escalates into the outlandish and the perverse. It is a style characteristic of some of the message boards of 4chan, a more insular online forum whose community is drawn towards entertainment of the more shocking and/or titillating variety. To say that 4chan is leaking is to identify a Redditor as being a member of both communities, a dual citizen who carries to Reddit the distinctive discourse of 4chan. If 4chan leaks then Reddit floods. In Facebook statuses, comment sections, and twitter streams the signifiers of Reddit abound, proliferated by its users. Sometimes it is the signature constellation of interests and topics that reveal a Redditor. She might be relaying some pithy slogan about the importance of digital freedom, the cultural significance of bacon, or the deeply flawed nature of Internet Explorer. Or she might be saying “For science!” or “tl;dr…” or “So brave!” or “I see what you did there!” or “I, for one, welcome our new _____ overlords,” or “Shut up and take my money!” or “An’ Frankly, I did Nazi that coming!” or “Faith in humanity restored!” or any of the other phrases peculiar to Reddit. It is a strange feature of human sociality that a person’s online activity is revealed in her speech. We conceive of ourselves as free agents, yet channel the expressions and ideas of our associates to the point where our words serve as recognizable signs of group membership. In such communal expressions we see that culture is not merely an explanation for the strangeness of distant others, but, rather, is something universal, manifested in all of us. But how does the community come to modify and inflect our behavior in this way? The answer lies in the iconography of Reddit, the pictures and bold white capital letters of the Internet meme. In the context of the Internet, a meme is an image or type of image accompanied by a caption that follows a formula particular to the meme. The classic example is the lolcat, a meme wherein text is superimposed over a picture of a cat to describe its present state from its own, half-witted perspective: “I can has prom date?” asks the kitten wearing the bow tie. On Reddit, visitors will see more contemporary memes, ones particular to the site. Inarticulate cats have been replaced by a set of characters that pass on bits of Reddit conventional wisdom via macro text. Some relay explicit advice while others pick out everyday moments that are common but not often discussed, the airing of which lets viewers feel a shared sense of experience. It’s a new package on an old tradition, the latest not-so-funny reincarnation of Jerry Seinfeld’s “Have you ever noticed…” monologues. More importantly, these images embody Reddit’s close association with “memes” as understood in a more technical sense: ideas (or behavior) that replicates through non-genetic transmission. Reddit is an ideal platform for meme transmission. 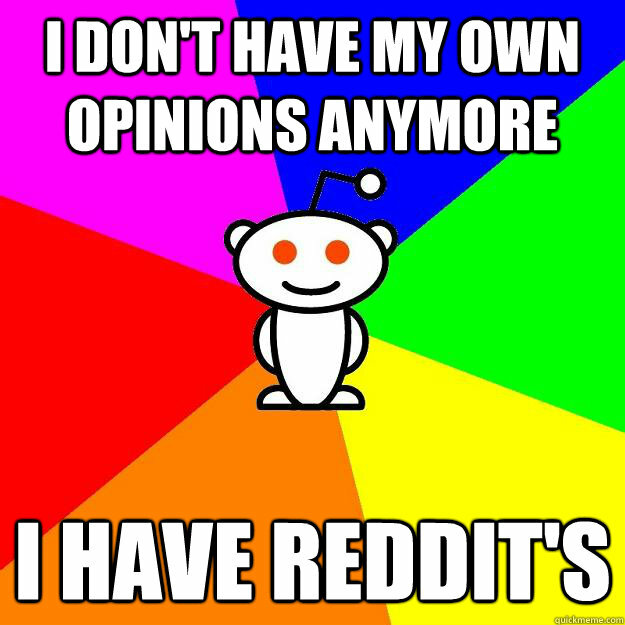 According to a recent Pew Poll, six percent of all American adults who use the Internet are Reddit users. This sizable audience represents an army of potential hosts for memes—a potential that is readily converted into actualized adoption and propagation via the participatory nature of Reddit. By having the audience contribute all of its content, Reddit encourages people to not merely consume its devices and truisms but to adopt them as their own, to internalize and redisseminate them like an animal regurgitating a recent meal so as to eat it again. This recursive process is powered by a democratic points system wherein Redditors are awarded “karma” for each “upvote” that their submitted content receives. Content that draws a high number of upvotes will then float to the top of the site, giving it greater visibility. Through this system, Redditors are incentivized to post the content that they believe will garner upvotes—and the surest method for achieving this end is to mimic what has been successful in the past. The most brazen form of content mimesis is the “repost,” where a Redditor resubmits someone else’s highly-upvoted content in the hope that it will be highly-upvoted once again. Beyond this blatant duplication, however, there are countless shades of karma-seeking imitation, ranging from the repackaging of a popular idea to the use of a popular package for a new idea. Thus, while only a few users resort to exact imitation, Reddit nonetheless ends up filled with the repeated catchphrases and concepts of the meme. The spread of such concepts beyond the parameters of Reddit reflects the platform’s unparalleled ability to incubate memes. With its millions of users, the site has a huge pool of contributing talent to generate the content from which a meme might emerge. At the same time, the voting system provides users with near-instant feedback, allowing them to refine their submissions and perfect their intuitive sense of what will go viral. And, since the most popular content also becomes the most visible, users are provided with a gold standard to mimic and draw upon for inspiration. This combination results in a site capable of churning out highly-seductive and transmissible catchphrases—ones so powerful that they have spread far beyond the boundaries of Reddit to the anglophonic culture at large. Indeed, the memes of Reddit are bred so strong that they easily displace locally-grown culture, filling up individuals’ cultural vocabularies at the expense of their own unique or subcultural expressions and ideas. The result is a striking homogenization of culture wherein New York Times columnists parrot the idioms of webcomics made by pre-teens, categories like the fedora-wearing “neckbeard” are widely-shared, and Reddit observations like the trite “deliciousness of bacon” meme are near-impossible to avoid. Although there are few quantitative measures that might confirm the observation, Redditisms seem ubiquitous in the broader cultural discourse to the point where they have begun to drown out localized cultural variation and diversity. Whether this growing homogeneity seems worthy of lament will vary according to one’s taste. For those who thrive on novelty and originality, the Redditization of culture is a disaster, with cultural content devolving into an endless repetition of the same set of tired banalities. By contrast, those who enjoy familiarity and the sense of community that comes with shared expression will find comfort in a cultural world bound together by interlacing memes. Such evenhandedness is harder to muster when it comes to Reddit’s mimetic influence on politics. Just as pictures of cats and affirmation of bacon circulate as memes, so, too, do ideology and political argument. Bits of reasoning are picked up and redeployed in debates by those who find them clarifying or whose presuppositions the arguments support. This circulation of ideas is particularly visible on Reddit where the same debates are had over and over again, each successive iteration providing participants with the opportunity to refine their arguments and try out whatever new ones they have picked up in the intervening period. The most appealing of these get then get upvoted, and the same meme-generating process that spews catch-phrases across the Internet manifests itself again, now with arguments as its object. Were Reddit an ideologically-diverse site, the mimetic process might be understood as making dialectical progress, with different schools of thought co-evolving to the point where perhaps some reconciliation might be reached. In point of fact, however, the overwhelming majority of Redditors share a narrow set of ideological presuppositions—the result being a site that more closely resembles a crowd-sourced think tank generating ever more infectious arguments for dissemination to the masses. Most of the ideologies promoted by Reddit are fairly benign—e.g., anti-interventionism, science-based skepticism, support for marijuana legalization, a distaste for intellectual property, and others. Reddit is not, as some have so glibly misdescribed it, a collection of “Ayn Rand Spark Notes,” but, rather, leans strongly towards economic populism, with large quantities of scorn regularly heaped on those who espouse even the slightest hint of Randianism or principled libertarianism. In more general terms, the Reddit Consensus lies somewhere on the leftward side of the Democratic Party with the average Redditor concerned about inequality, in favor of LGBT rights, and supportive of government spending and moderate redistribution. What is troubling, though, is that such innocuous politics now coexist with a rising tide of racism that is slowly engulfing the site. Reddit has long been reactionary when it comes to the politics of race and gender, but typically that has taken the more-moderate form of the privileged person who petulantly drags his feet in resistance to the implication that he has done something wrong or is the beneficiary of injustice. Thus, while the average Redditor might have habitually bashed the /r/ShitRedditSays subreddit—a subforum whose subscribers call out problematic attitudes and speech—his attacks often seemed motivated more by a fear of one day being an ShitRedditSays target than an affirmation of sexist or racist tenets. 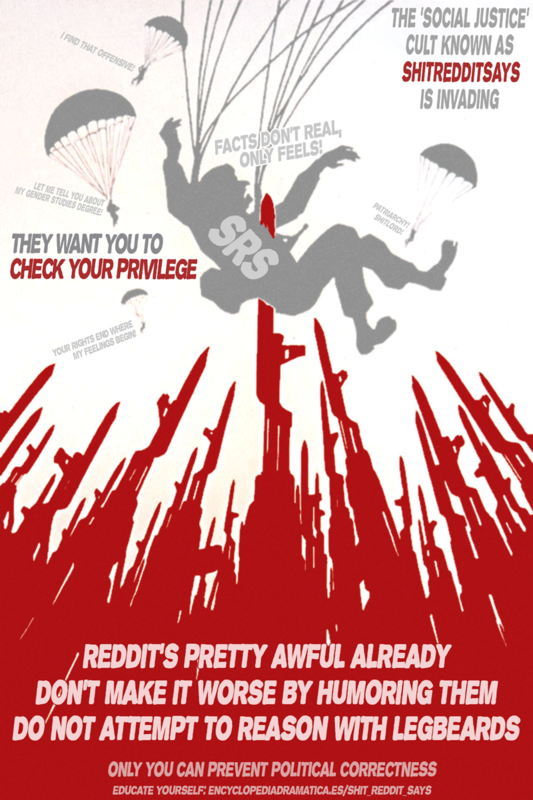 Thus, while Redditors have disappointingly exhibited a greater ability to empathize with those who might be publicly embarrassed for holding oppressive opinions than those actually oppressed by such opinions, popular regard for the opinions themselves has always seemed limited to a few extremist subreddits. Recently, however—and particularly on the subject of race—Reddit seems to be increasingly dominated by argument-memes that are explicitly anti-egalitarian with respect to identity. Whether it is the frequent discussions of “black crime,” KKK apologism (related: holocaust apologism), or just explicit bigotry, the comments on Reddit when race is brought up have come to resemble those found on explicitly white supremacist forums. Though difficult to quantify, it is a trend that many Redditors have noted—a proliferation of racism that appears to be less of an outside invasion than an internal mutation which, by means of mimesis, has spread like cancer throughout the body. Meanwhile, antiracists appear to have largely retreated from the most popular subreddits, abandoning the bulk of Reddit territory to their antagonists. This process has been fueled by an active core of racist ideologues who devote significant time and attention to proselytizing on Reddit. These demagogues—who inhabit subreddits with charming names like /r/whiterights, /r/whitepride, and /r/niggers—seek to piggyback on Reddit’s anti-PC sentiment by passing off pernicious stereotypes as “I’m going to hell for this”-type jokes. And, of course, any time the white supremacist trope of “black crime” can be worked into a discussion, these extremists will be on hand to insert their propaganda. These tactics are further augmented by “brigading”—a Reddit term for when an organized group of ideological Redditors swarm a given thread and vote up the comments they agree with and downvote those that contradict their views. Though the practice is officially outlawed on Reddit, it is difficult to prevent, and is proven in its effectiveness when it comes to swaying popular opinion. One recent study has shown that that people are more likely to upvote something that has already received an upvote—particularly when the subject pertains to politics, culture, and society. The implication is that brigading influences how people perceive a comment’s quality; by upvoting arguments en masse, ideological Redditors can make their views seem popular, reasonable, and moderate. At the same time, downvoting comments makes them less visible, effectively burying opposing views under ideologically-favorable material. While certain subreddits brigade spontaneously in knee-jerk outrage, the racists of Reddit have explicitly embraced the tactic as a means of popularizing their message. Indeed, the Reddit administrators recently banned /r/niggers for repeatedly and unapologetically engaging in the practice, while blocking some of the more vitriolic users from the site entirely. Whether the bans have been effective in curbing the racist brigades is unclear. However, even if effective, they seem too little, too late, with racist vote manipulation having apparently already established a grassroots racism that renders the practice superfluous. Even more concerning is the possibility that the racist ideology on Reddit will be translated into violent practice. Reddit’s tendency to spawn outrage and malicious mobs is already well-documented. The medium is conducive to such behavior, spawning outrage through decontextualization. On Reddit, interested parties can present their side of the story as though it were the whole truth—a limited framing that obscures the complexity and mitigating factors that might exonerate the accused. In this way, complex human conflicts arising from legitimate differences are too often reduced to the sort of morality plays capable of inciting self-righteous mobs to seek vengeance. Combine this tendency with engrained racism and one cannot help but worry that IRL lynch mobs might emerge once again. If this seems alarmist, consider the recent Reddit thread with the Stormfront-worthy title “Racist black kids bully white toddler” that had to shutter the comments section due to witch-hunting and the revelation of personal information. Or, the fact that when a video circulated of a (black) security guard tossing out a belligerent (black) woman and tasering her, Redditors heavily upvoted a post stating “If someone tells me this is black culture…. it needs to be eradicated,” before donating over $23,000 to better arm and equip him. Similarly, in the aftermath of the Trayvon Martin murder, a white supremacist member of neighboring 4chan’s fringe-right /pol/ board hacked into Martin’s email in an effort to discredit the slain teen and exonerate his killer. These examples are just some of the more visible incidents and, while some are more clear-cut instances of violent white supremacism than others, they all lend substantial credence to the idea that an increasingly-racist Reddit might give rise to more organized racial harassment. Beyond this terror, there is no small disappointment in witnessing the co-optation of what is otherwise a striking technological platform. On Reddit, millions of people with wildly different backgrounds come together to exchange ideas and debate politics as equals (insofar as one’s identity is protected). In this respect, it is an impressive realization of democratic communicative potential, the logical conclusion of the process that was first sparked by the invention of the printing press or even the written word. The fact that white supremacists have managed to subvert this emerging communicative space to further racial hatred is mortifying. Yet the struggle for the future of Reddit—and, by extension, the public sphere—is not over. The political left has devoted much time and attention to critiquing Reddit, but it now needs to embrace the forum—to upvote early and often so as to sway the undecided away from the fringe right. At the same time, the comments section on Reddit provides the unique opportunity of reaching millions of people who would never think to pick up a copy of Dissent from a newsstand. The white supremacists are already capitalizing on this captive audience. It’s time the left pushed back. ~ Guest blogger Jesse Elias Spafford (@jessespafford) is a research assistant at the Institute for Communitarian Policy Studies at The George Washington University. He enjoys writing about power, politics, and culture. One of the most-viewed topics on the white supremacist forum Stormfront—second only to a collection of the tenets of National Socialism—is a catalogue of “ethnic crime.” To anyone who has spent enough time reading online comments, the popularity of the subject will not come as a surprise. Any time that a member of a minority group appears in the media as the perpetrator of a crime, a vocal core of commenters emerges to point out the offender’s ethnicity, using the observation as a springboard for introducing a slew of canned statistics regarding minority crime rates. These talking points have become a fixation, an expression of what racists consider to be a profound truth: that non-white individuals commit a disproportionate amount of crime. Of course, the demagogues will gleefully rebuff any accusations of racism, insisting that they are, in fact, scientists, courageously presenting facts to illuminate the social world. This is nonsense, but to see why requires shifting attention from what was mentioned to that which was omitted. While there is undeniably a correlation between ethnicity and crime, there are many such correlations that go miraculously overlooked in these discussions. Males, for example, commit an overwhelming proportion of all crime, but you will never see one of these ersatz sociologists taking the time to point out just how overrepresented men are in the criminal justice system. In other words, the move from observing criminality to discussing the perpetrator’s ethnicity is not an inevitable one, but, rather, a careful emphasis of one particular property among many. As such, the mention of race should not be mistaken for authentic sociological curiosity, as it is, in fact, a conscious ontological choice motivated by underlying racist ideology. The comments display a relationship between evidence and mindset analogous to psychoanalyst Jaques Lacan’s case of the jealous husband. Lacan argues that the husband who, through persistent investigation, uncovers proof that his wife is cheating on him, exhibits pathological behavior despite being vindicated by the facts. His jealousy is a pathology because the suspicion predates the evidence: the husband would be driven to hunt for evidence of infidelity regardless of whether there was any reason for him to think that his wife was having an affair. Given this disconnect from the facts, the important question for Lacan becomes investigating what it is that motivates the husband’s jealousy. What underlying psychological features give rise to an ungrounded suspicion that seeks confirmation? The commenters who sort crime statistics by race are akin to the jealous husband in that they are not driven to a theory by the evidence, but in search of evidence to support their theory. Crime stories act as Rorschach tests, revealing latent ideology through what is perceived and emphasized. In theft, liberals will see the consequences of poverty while anarchists see its rectification; in violent crime, gender theorists will notice the masculinity while racists will emphasize the ethnicity, an ontological choice reflecting both their pre-held conviction of racial superiority and their desire to spread that belief to others. One must then ask the same question of the white supremacist that Lacan does of the jealous husband: since the racism of the former is not derived from evidence and, instead, pathologically seeks corroboration, then what is its origin? What draws a person to racial superiority if not the facts? To answer these questions, it is necessary to turn away from the empirical to face the cultural, shifting focus from the news-based Stormfront threads to one in which members post pictures of their favorite pieces of visual art. It is a popular discussion that, while dominated by a few contributors, contains a set of clear patterns with the potential to reveal the inner workings of the racist mind. In the aesthetic preferences of the white supremacists, the attraction of their ethos becomes understandable, the posted images reflecting the psychological rewards that lead people to adopt the ideology in the first place. The first sort of recurrent image is the depiction of white culture. Included within this category are paintings of attractive Aryan women with blonde, braided hair; Germanic parents telling stories to children or teaching them how to garden; depictions of Roman and Greek architecture; and Rockwellian images of segregation-era civic life. These paintings and photographs capture a sense of cultural value, an aesthetic of existence historically associated with white skin and, in the racist mind, necessarily so. The images have been chosen because they depict what white supremacists are proud of: an intuitively noble way of living that they wish to claim for themselves via their phenotype. Interspersed among these images are the landscapes. While it is easy to discount these paintings as unimaginative filler, they, too, shed light on the allure of racism. Notably they depict not merely nature, but its intersection with civilization, juxtaposing the untamed dangers of the wild with the safe havens of human habitation. Repeatedly featured are small hamlets nestled among imposing mountains, wagon trains voyaging across the desolate plains, and ships battered by raging seas. In The Art Instinct, philosopher Denis Dutton proposes that an aesthetic preference for safe environments would confer a distinct evolutionary advantage on those early humans who possessed it. 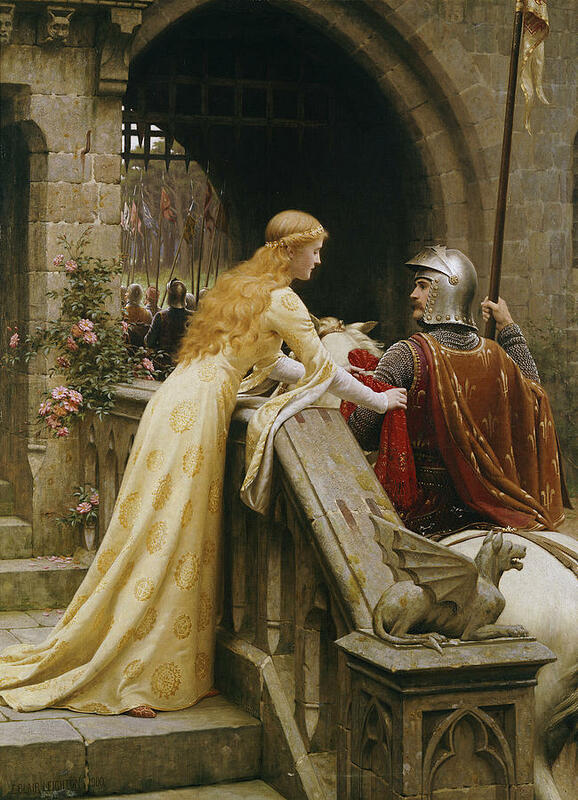 While their philistine counterparts wandered off into dangerous territory, the aesthetes would be lured out of harm’s way, their survival allowing them to produce offspring who shared their disposition. In the landscapes favored by white supremacists, we see this evolutionary preference manifested. They are the scenes that Dutton argued humans are predisposed to find attractive, where the evidence of human presence implies safety in the face of inhospitable wilderness. From such an evolutionary perspective, we can see how the landscapes introduce an element of aesthetic danger into the thread, a sense of peril that can’t help but inject itself into the depictions of “white culture.” The connection between the domestic scene of a white family and the little cottage in the valley is quite literal: it is hard to not imagine the former inhabiting the latter—and from there, a more metaphorical reading follows. It is not merely that white people are aboard the ship being battered by the ocean, but that “white culture” is this ship, a small safe haven in an otherwise dangerous and barbaric world. Taken together, the landscapes and cultural images convey the unmistakable impression that “white culture” is something to be protected, a bastion of civilization in an otherwise-savage environment. That these images appeal to white supremacists does much to explain their radical politics. Here we see a group of people who have a strong attraction to the motif of the hero, the protector who defends a community from the forces of darkness and evil. For those seeking a sense of purpose and meaning, these white knights offers a particular vision of what it means to be a protagonist, one that easily overlays onto the contours of contemporary political life. One must merely identify a culture that seems besieged and position oneself in opposition to whatever is perceived as threatening. The only question is which group to affiliate with—a lacuna that, for the unimaginative, is most easily filled by the white supremacist narrative. It is the facile choice, one obvious in both its historical prominence and its childishly literal reading of metaphorical struggles between light and darkness. Rather than develop novel or sophisticated views of group conflict, white supremacy allows would-be heroes to follow the path of least mental resistance to the clash of civilizations already formulated in the pages of Mein Kampf or The Lord of the Rings. This proposition—that hero envy underlies a significant portion of racist thought—is supported not merely by the far Right’s obsession with “ethnic crime,” but also its general preoccupation with victimhood. That a dominant and heavily privileged group would take so seriously the minor incursions of “reverse racism” seems bizarre until it becomes clear that such “threats” are essential to sustaining the perception that white people are in danger and, thus, in need of heroes to boldly protect them. Absent such encroaching peril, white supremacists are at risk of being revealed for what they truly are: self-important shills who oppress others to advance the interests of an arbitrary phenotype. To confront racism, then, we must pass over the endless empirical debates and, instead, lay siege to the mythos. We should contest that race is a significant category—why fight for one’s race rather than one’s socioeconomic class?—or even a stable one: who exactly counts as “white?” Watching white supremacists debate these questions gives the distinct impression of adversaries tugging at the threads that threaten to unravel an uneasy truce. More challenging, however, is creating alternative conceptions of heroism that are not built upon zero-sum conflict between different groups. At their best, antifa movements act as just such an outlet, allowing young people to channel their heroic aggression towards universalist causes. Unfortunately, for those vulnerable to the temptation of racism, the far Left probably holds little appeal. If we are to divert these individuals, we must develop something new, an alternative aesthetic that provides a sense of purpose without necessitating the subjugation of others. While this is a daunting challenge, it is perhaps the best chance we have to undermine ideologies of hate. As tempting as it is to try to dissuade racists by presenting them with statistics and evidence, to do so is to merely grapple with the fringes of their racist paranoia. Only through art can we eliminate the pathology at its source. ~ Jesse Elias Spafford, BA, is a recent graduate of Pomona College, and currently works as a Research Assistant at the Institute for Communitarian Policy Studies at George Washington University.